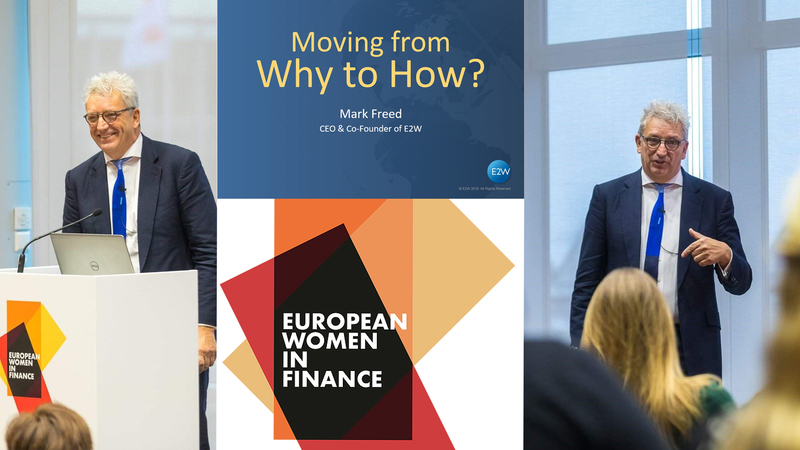 I was a speaker at the European Women in Finance conference in Amsterdam recently and I was asked to speak on how we can reach the ‘utopia’ of when gender diversity isn’t an issue and I’m out of a job! I talked about men joining the campaign (this blog post alludes to it) and of course, I discussed what financial institutions could do too. I’d like to share with you some of that content as it’s a great summary of where we’re up to as a sector and showcases some of the good stuff that firms within this industry are doing to reach the destination of gender diversity. Dinosaurs. They are organisations that are just not on the journey. They don’t care, will not adapt or evolve. They are becoming extinct and fortunately, are few and far between. But beware they are often big, powerful and dangerous - give them a wide berth. Box Tickers. This covers a wide variety of firms, from those just setting out, to those already on the way. They are ticking boxes but without a well-defined strategy – they’re ‘ticking and hoping’. Leaders. On closer inspection, these firms really stand out. Typically, they have an overarching, detailed strategy to reach the destination – they’re not ticking random boxes and hoping. The budgets and targets they have set. Most importantly they will be able to demonstrate how that commitment filters across the organisation - everyone in the firm has a role, a purpose, a part to play and change to make. 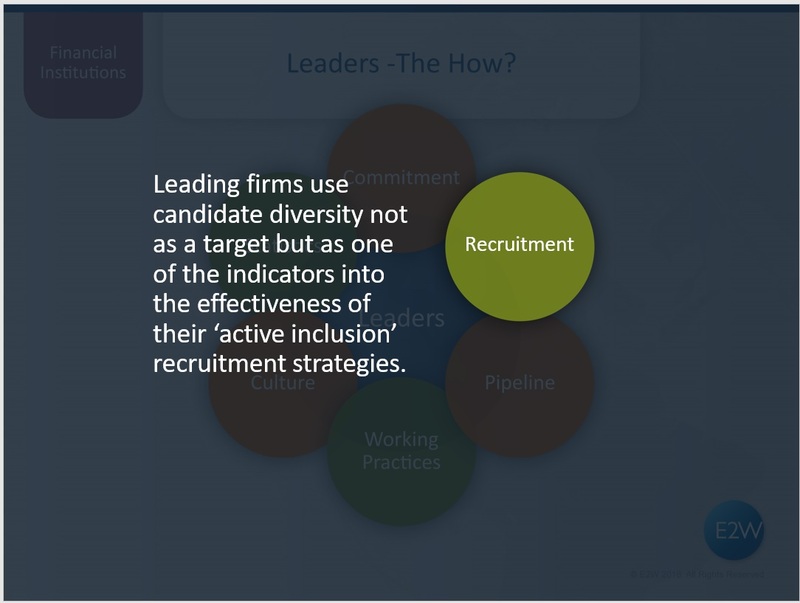 Box tickers will say they have set their recruiters targets for diverse candidate slates; in reality, the recruiters find, say, five typical and qualified candidates then, under time and cost of hire pressure, will find five diverse candidates who will ‘do’. In their opinion, it’s not their fault if hiring managers don’t hire women; they, the recruiter, have met their targets. They have made diversity a priority - they locate diverse candidate pools and search for diverse candidates before typical candidates. They ensure that as a valuable diverse candidate whatever the outcome you’ve had a positive experience. In one case this also includes being given a candidate mentor. They understand that women have career breaks and that as a woman returner sometimes all you might want is the opportunity to return to work and not an internship. The Next Generation – Areas such as technology, front office investment banking & investment management have a particular and acute diversity problem. Leaders are investing in working with schools, colleges and universities to inspire and attract young women into the industry. Building a following - attracting the best. Leaders invest in identifying and creating positive relationships with a wide range of people, including those that are passive, happily working for a competitor. They promote themselves as an employer that offers a culture and working practices that will enable diverse candidates to succeed, grow and flourish. This is an important investment and one that provides a great return. 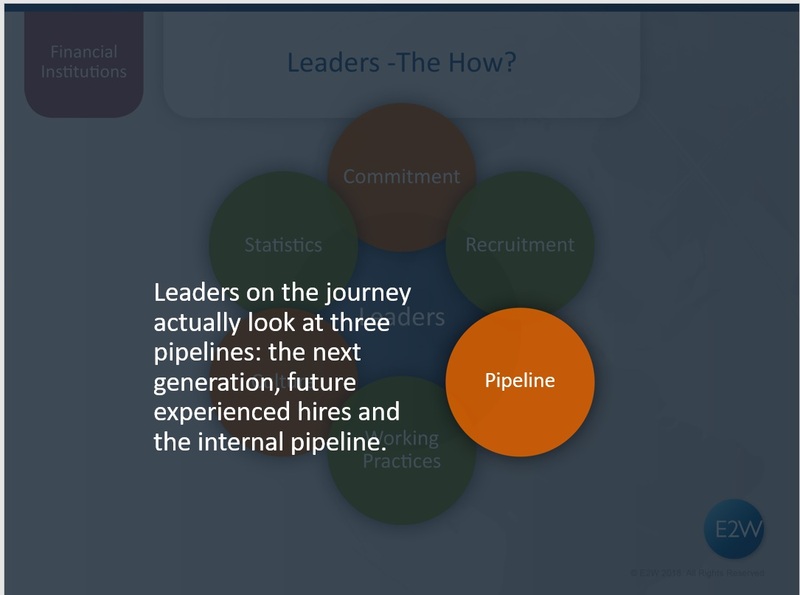 The Internal pipeline – Most banks actually employ roughly an equal number of men and women. The problem is that they are not evenly distributed across and up and down the organisation. Leaders on the journey are putting in place learning and development strategies to ensure that diverse employees can develop and hone their skills to advance. As well as job related training, leaders ensure that these individuals are given coaching and mentoring to allow them to remain true to themselves and help spearhead cultural change. Working practices and culture are so intertwined and they’re so important. This is the environment in which employees are working day-in-day-out and it contributes highly to morale and happiness. Leaders recognise that everyone in their diverse workforce will have a unique set of ambitions and needs which will change over time. They have developed benefits packages that are designed for all – holiday schemes, child care, paternity and maternity leave etc. They recognise that people have different needs and priorities over the life of their career. An individual’s ability to make career commitments and / or their ambitions will change over time. Leaders recognise this and offer different career paths and career mobility to facilitate it. They also recognise that working practices go beyond benefits. What charities and affiliation links does the firm have? How do they handle misconduct? Is there a mechanism to report and handle unacceptable behaviour? They actively encourage staff to ASK for support, to be open about their challenges and barriers and also their ambitions. They want to work with their staff not against them and recognise the cost of replacing and retraining staff. They put sponsor and mentor programmes in place to ensure all levels interact and learn from each other’s experiences. Culture is, of course, so important. Many financial institutions have been criticised for their macho, testosterone fuelled culture. People often say if only it had been Lehman Brothers and Sisters. To reap the benefits of diversity, firms need to change their culture. They need to become more inclusive. Leaders on the journey recognise that they need to embrace, encourage and create a truly inclusive culture where everyone can flourish, succeed, contribute, fulfil their immediate and long term ambitions and bring themselves to work. Cultures that encourage teamwork and respect for all. Cultures don’t and won’t change overnight. Leaders are implementing programmes that power performance and transform cultures by connecting heads and hearts, reason and emotion, driving long-term success by enabling individuals and organisations to pull together. They focus on strengthening both capability and culture in order to create lasting change. 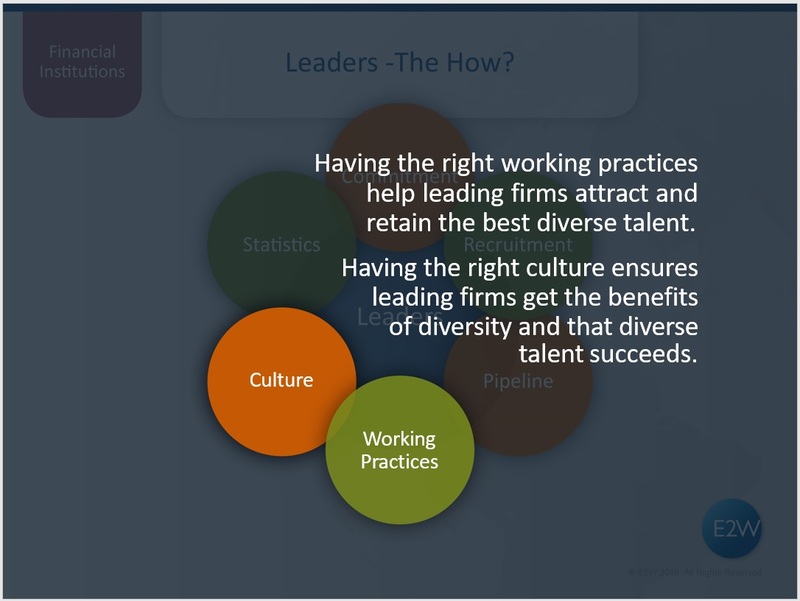 Having the right working practices help our leaders attract and retain the best diverse talent. Having the right culture ensures our leaders enjoy the benefits of diversity and that diverse talent succeeds. Box tickers will often implement diversity activities that turnout not to deliver the benefits because they are not ‘tuned’ to the actual problem. That is often because they have not looked at the data or statistics. If your problem is not being able to retain female talent or they are not being promoted, recruiting more women is not the answer. Understanding why women are not staying or being promoted will point to the problem and solution. Leaders on the journey measure everything. They set targets and have indicators to progress. I gave the example earlier about box tickers setting targets for diverse shortlists in recruitment, whilst leaders will use this same statistic as an indicator of success of other strategies. Leaders are tuned into the problem and implement effective solutions. 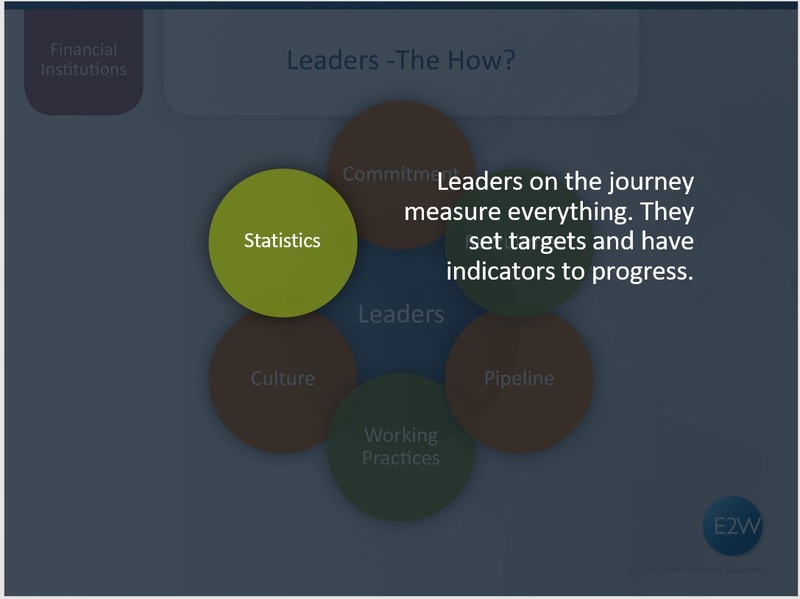 Leaders refine their strategy based on the data to keep them on course. 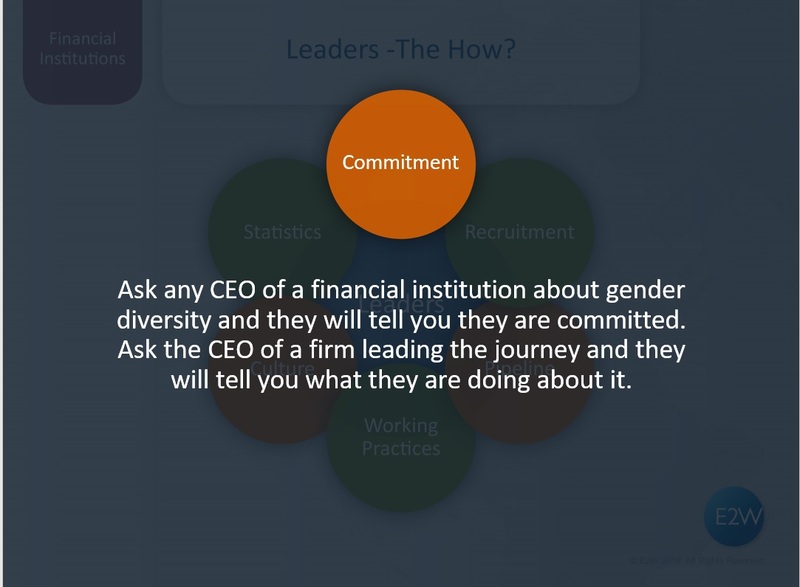 No bank has reached the destination of complete gender diversity but there are definite leaders out there. They still have a way to go but as these examples show we should commend them for their progress to date. 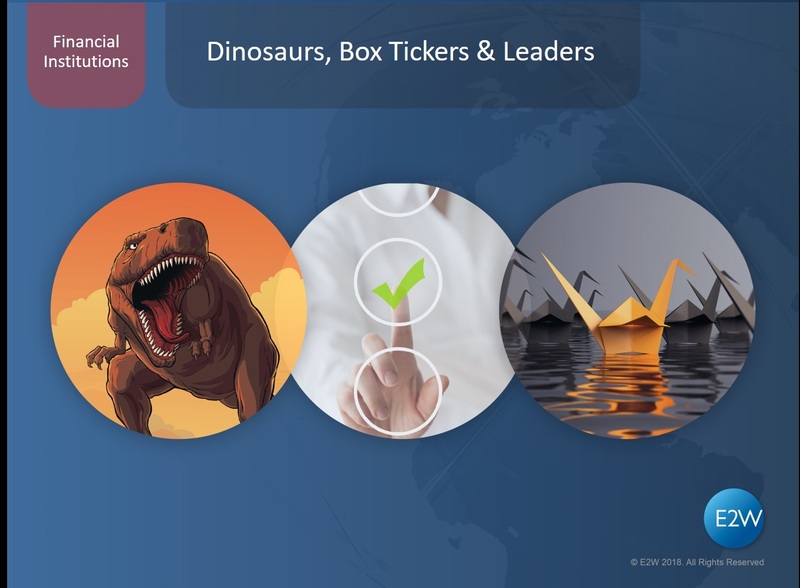 The box tickers need to sit up and take notice or else they will become dinosaurs and face extinction. If you think your employer is a box ticker and would like some help to become a leader, please call or email me. Likewise, if you believe your company is a leader and would like help in recruiting more highly talented and capable women, we would love to give them access to our community of 10,000 very special women working in senior positions in financial services.